What Lead to a City? 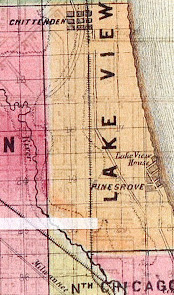 This image above is a 1862 map of the township and subdivision called Pine Grove now northern Lake View East while southern part of Lake View East was called Wright Grove. 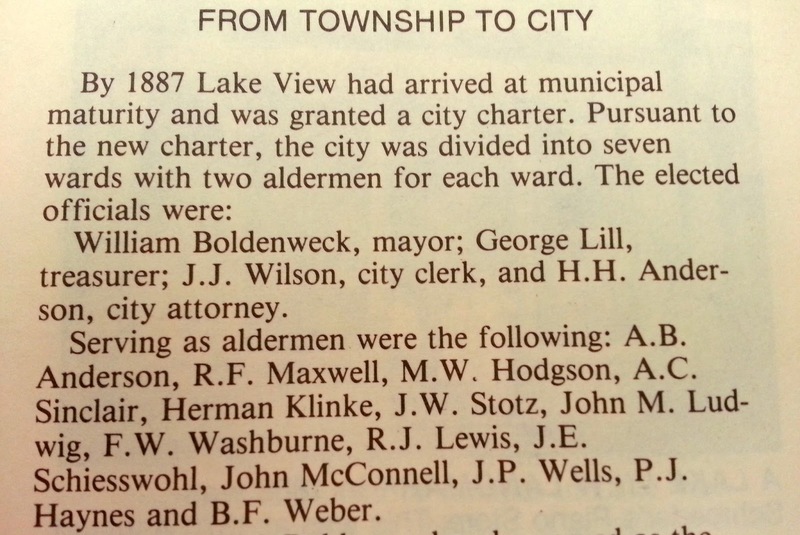 The Township of Lake View was established 1857-1887; the City of Lake View in 1887-1889. 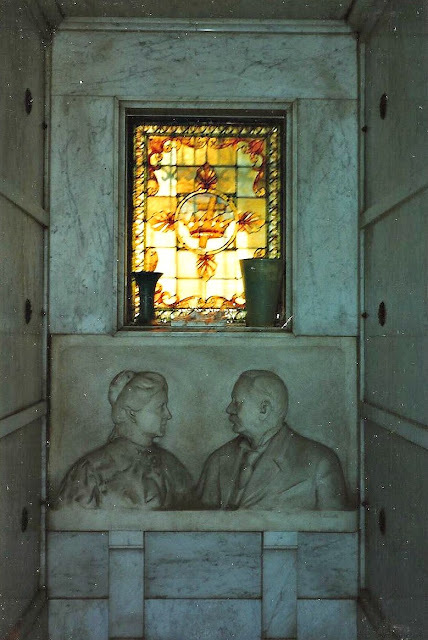 (The town of Chittenden was a subdivision now called Rose Hill Cemetery as of 1859. 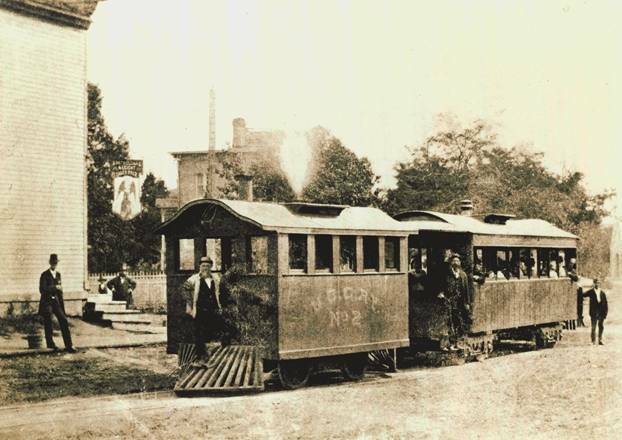 The rail line is the former North Western Railroad Company tracks that ran along in what was to known as Ravenswood Avenue. Jefferson Township is to the left and City of Chicago is at the bottom of this edited and zoomed map image.) Detailed sheet maps of the old township can be found online (scroll down) via History Works Maps of 1887. 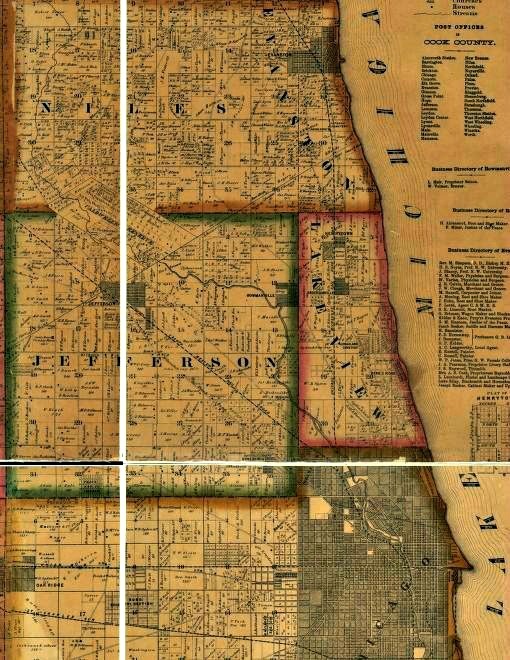 The population of the Township of Lake View grew to 1,840 in 1870 to 6,663 in 1880, apparently doubling in 1884 to 12,824 mostly residing south of Graceland Avenue, currently called Irving Park Road. 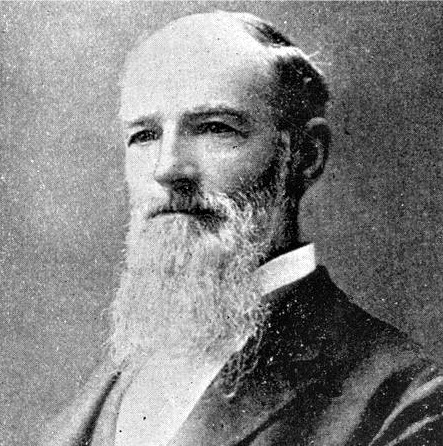 'From 1883 until 1887 [continued his partnership] with Ernst Haldeman and carried on the business. 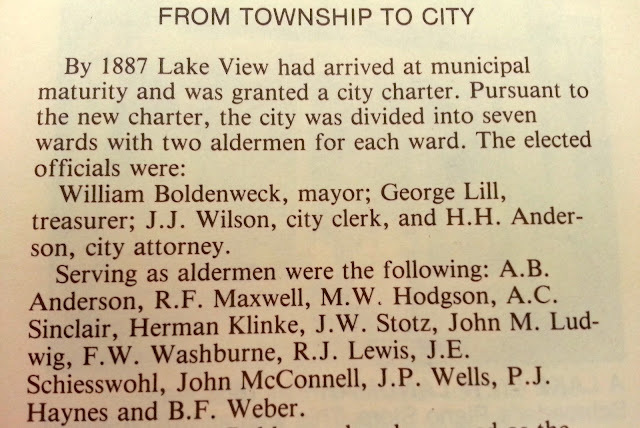 In 1887 Mr. Boldenweck retired and was elected to the office of Supervisor of Lake View then under a [township] organization. Afterward that he was elected the first Mayor of Lake View on the Republican ticket. 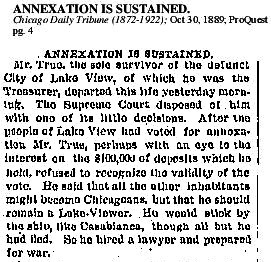 In 1889 he was re-elected Mayor of Lake View and was Mayor until that suburb was annexed to Chicago when the affairs of Lake View was turned over to the city officials in charge of the City of Chicago. 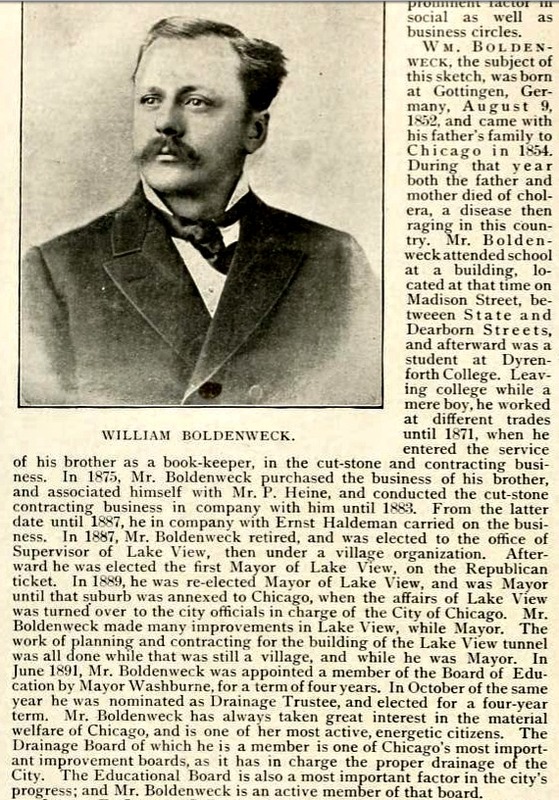 Mr Boldenweck made many improvements in Lake View while mayor. 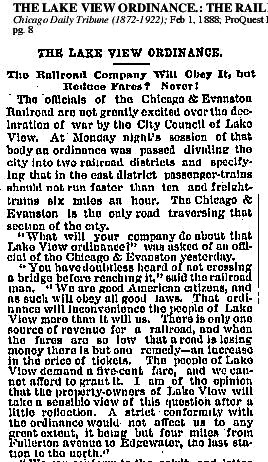 The work of planning and contracting for the building of the Lake View tunnel was all done while that was still a [township] and while he was mayor. 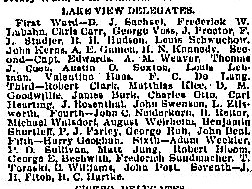 In June 1891 [two years after the annexation] Mr Boldenweck was appointed a member of the Board of Education by [Chicago] Mayor Washburne for a term of four years. In October of the same year he was nominated as Drainage Trustee and elected for a four year term. 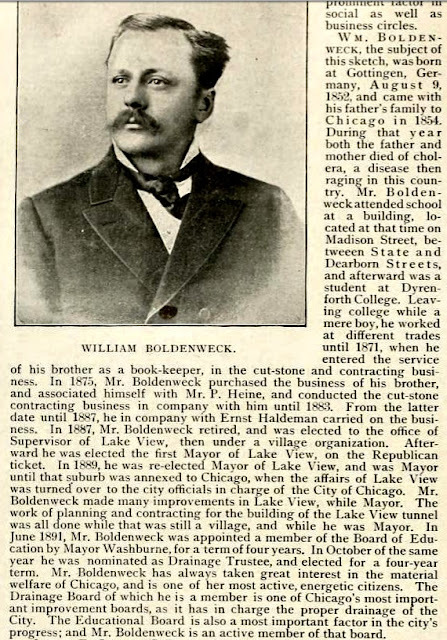 Mr Boldenweck has always taken great interest in the material welfare of Chicago and is one of her most active energetic citizens. 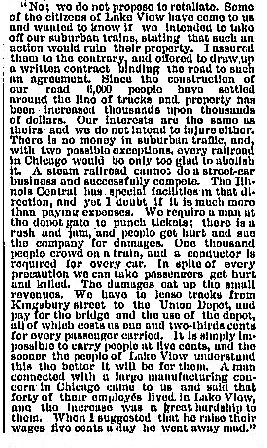 The Drainage Board of which he is a member is one of Chicago's most important improvement boards as it has in charge the proper drainage of the city. The Educational Board is also a most important factor in the city's progress and Mr Boldenweck is an active member of that board. 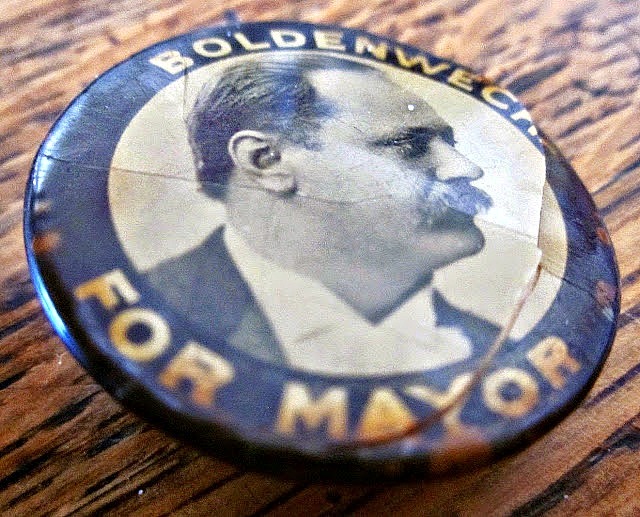 Mr Boldenweck was a strong candidate for the nomination of mayor of Chicago in the convention that nominated Judge Elbridge Hanecy for that office June 29 1906. President Roosevelt appointed him assistant treasurer of the United States which office he is now holding.' The former mayor of Lake View died in the country of his birth in 1922. The 1887 spring and fall election results were close; mostly pitting special interests like saloon-keepers against folks who demanded clean water particularly for school students. 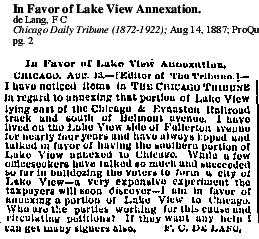 A continuous petition campaign for annexation to Chicago would continue for the next two years. Former township districts became seven wards. Each township district passed ordinances based on citizen approval that was now lost in the city form of government. 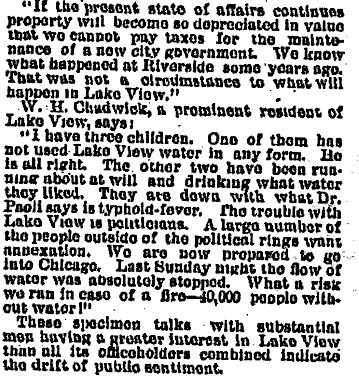 The publication called the Lake View Saga indicates that the communities that were now under city governance that was once under township authority. According of the articles that this blogger read the township government operated fairly well; the city government not so much. 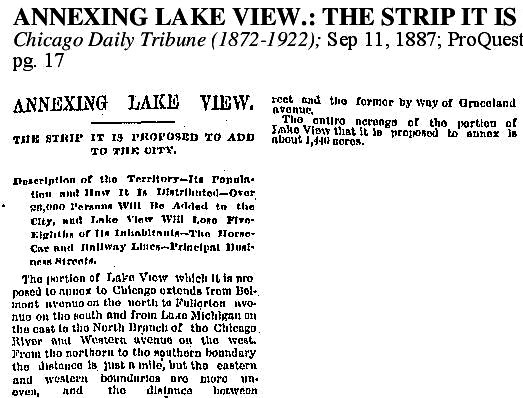 In fact, the city was established by a lobby of private interests that did not want any part of Lake View to be annex to the City of Chicago in 1887 nor 1889. 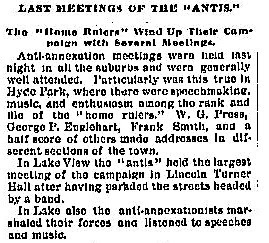 For a decade before the 1889 annexation their were two political camps, the pro-annexationalists (real word used at the time) and the anti-annexationalist. 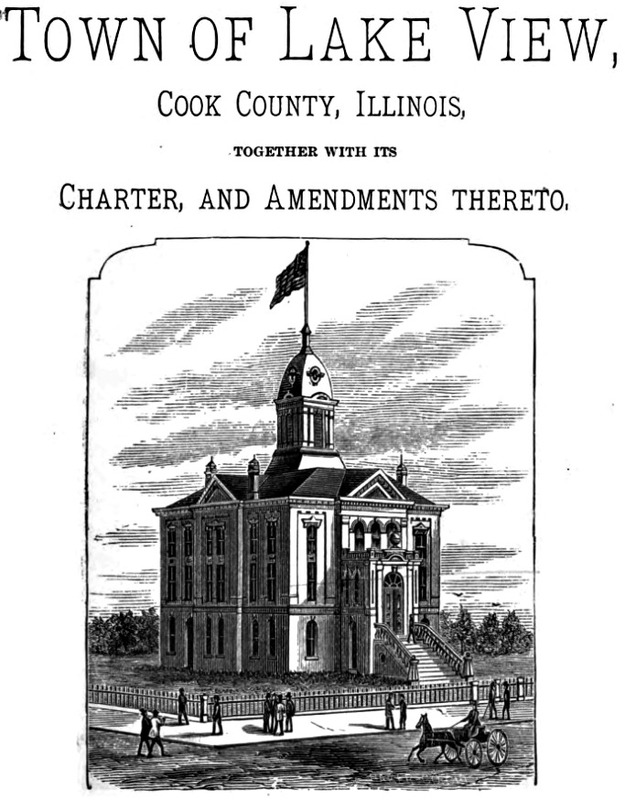 Residents who wanted more than basic services than a township form of government could provide petitioned the Illinois legislature for incorporation hoping more tax revenue could be generated as a city then a township form of governance - as a city based on the elections results of April 1887. 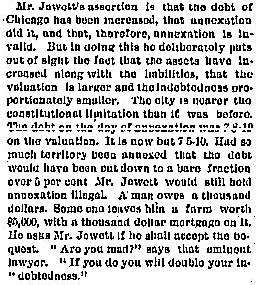 The anti-annexationalists were mostly special interest groups that wanted to avoid Chicago regulation and the control from Chicago City council. 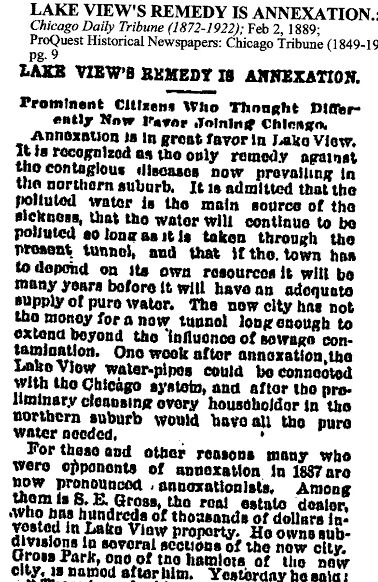 1) clean water supply - in the early days of the township the tunnel from the Lake View crib to Lake View Pumping Station linked a lot; the source of little known disease at the time called cholera and typhoid that caused a fearful periodic epidemic prior since the mid 19th century, 2) increase taxation along with a popular issue about free postage service, 3) cost of infrastructure such as construction, maintenance, expansion of streets and roads which included wider street space for new trolley and railroad services, 4) over-crowding of public schools, 5) although this issue was more reflective of township governance, the city of Lake View bordered the newer area of the park along the lake, Lincoln Park that was mutual administered by two cities. 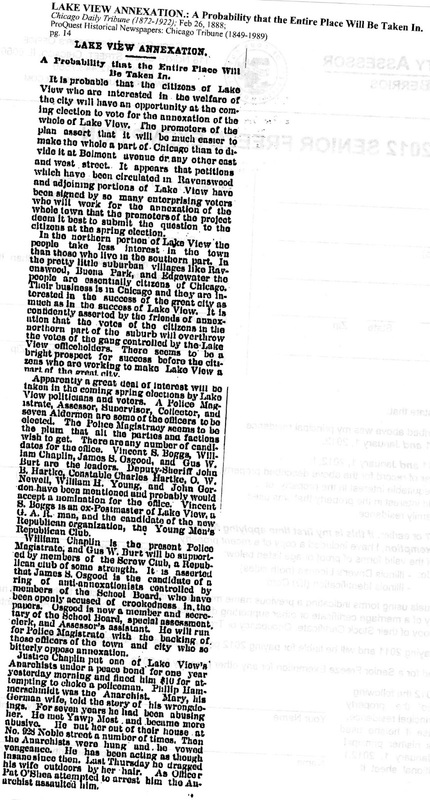 Apparently, the Lincoln Park Board of Commissioners, established by State of Illinois so to govern the maintenance and expansion of the park, included some citizens of Township then the City of Lake View. The membership of the Board included two members from Lake View - the township supervisor and the township Assessor and three others from the Township of North Chicago (a taxing entity) where the original park was formed within the City of Chicago. 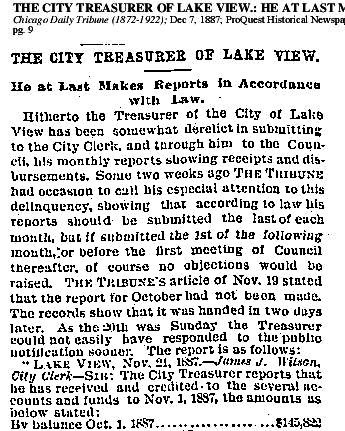 Several citizens of Lake View did not like the idea of a special commission taxing them without direct citizen representation 5) and finally corruption/ non-compliance in city departments that involved misuse of funds from the treasurer office. 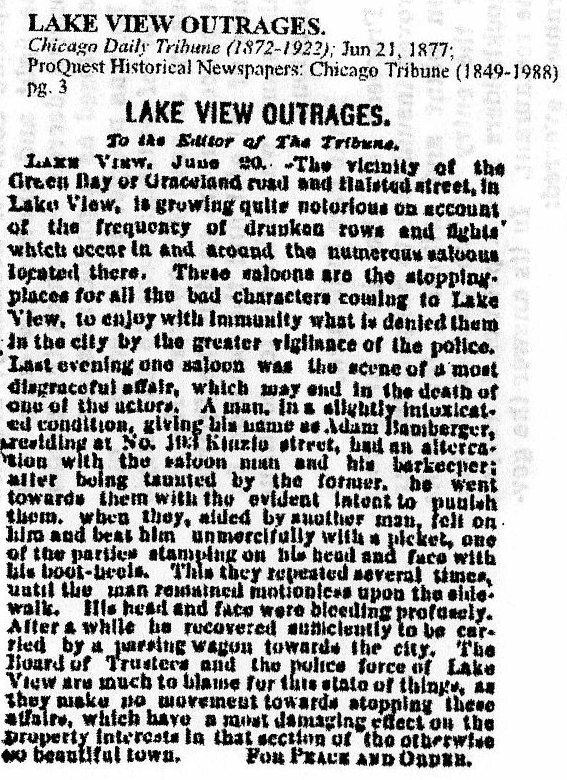 The saloon-keepers, a strong interest group and mostly located south of Belmont Avenue, were against annexation due to stricter zoning laws/taxation of liquor of the City of Chicago. 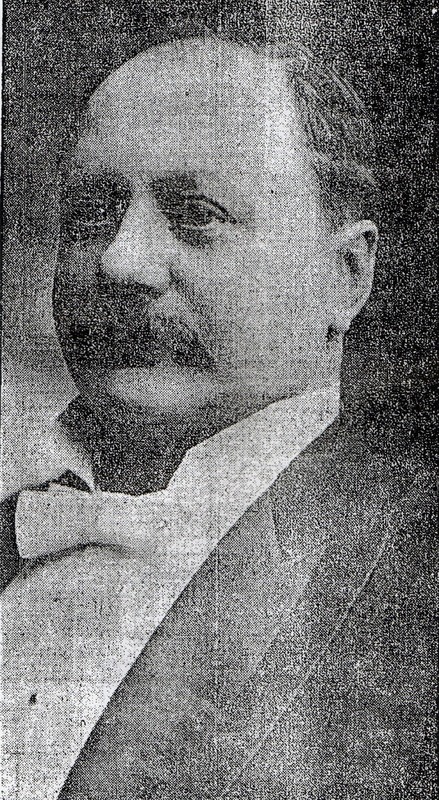 Large property owners who were initially partnered with the owners of the saloons the election of 1887 were two years switched sides due to alleged corruption charges of Mayor Boldenweck administration. Citizens of the northern areas of the city were never great fans of the idea of a city form of government. 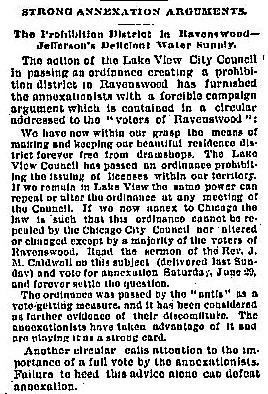 During the 1st attempt for annexation in 1887 the citizens of the township north of Belmont Avenue voted against annexation that election year. 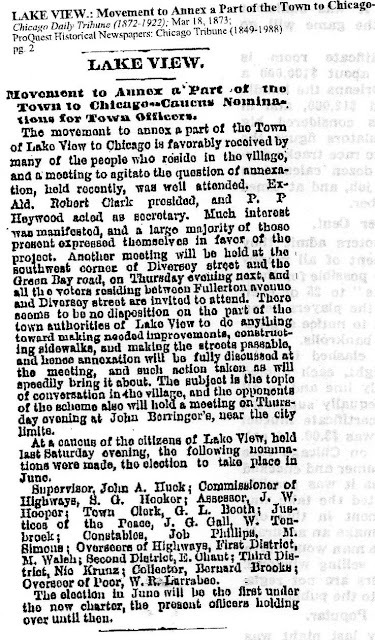 The majority the urban residents of the City of Lake View were located south of Belmont Avenue prior to annexation. 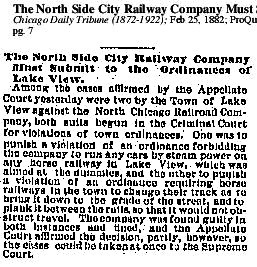 The North Chicago Railway Company ran their tracks through the township years before the creation of city government. The newly formed city demand court action against the company for fees lost to the new treasurer's office as well as a speed complaint apparently by citizens of a particular area of the city. 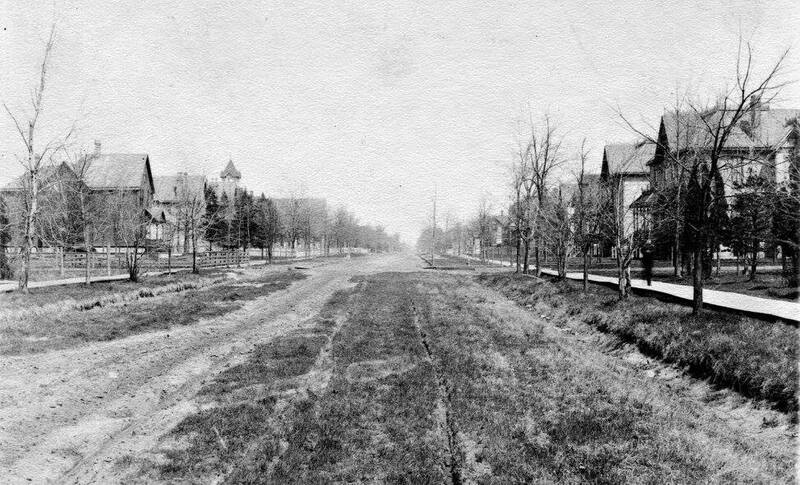 By the mid 1880's subdivisions dotted the landscape. 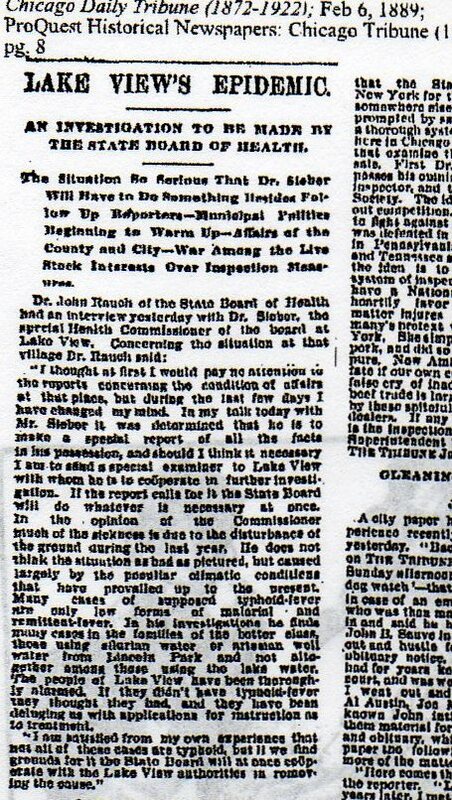 The issue began early on during the township days when the township had limited authority. 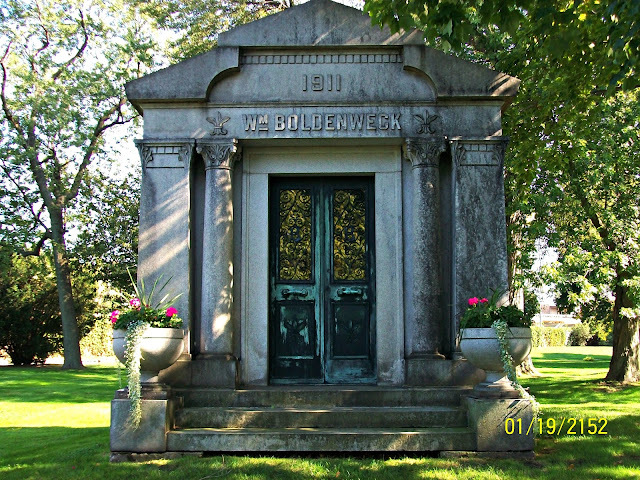 According the publication Hidden History of Ravenswood & Lake View by Patrick Butler the first and last mayor of Lake View "William Boldenweck seized his suburb's records and funds and barricaded himself in his town hall office until he was forced to back down by the Illinois Supreme Court". Apparently, I poor loser.... He lost; totals were 2,503 for annexation and 1,999 against that almost mirrored the 1887 totals but this time in reverse. 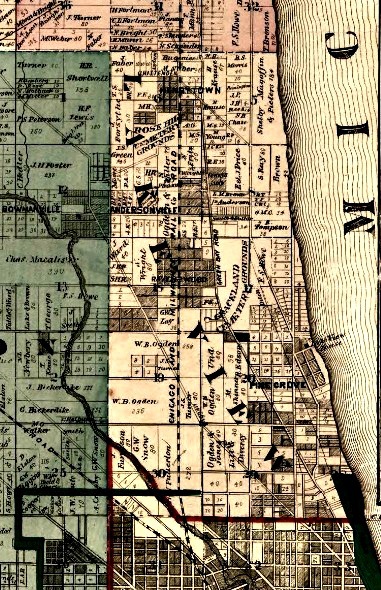 The City of Lake View would became the District of Lake View within the City of Chicago after that election until someone created the neighborhood. 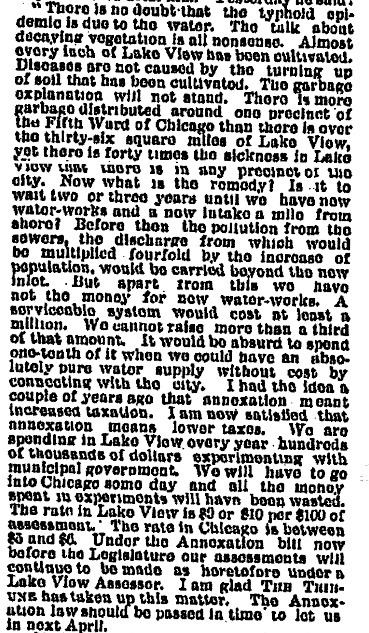 According to The Edgewater Historical Society ‘some Lake View aldermen who were opposed to the annexation were said to have offered $3,000 to the Mayor of Chicago in order to drop the proposal. 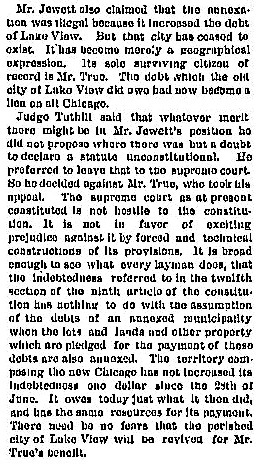 Later, those aldermen were advised that they couldn’t offer what amounted to a bribe on this issue. The vote in the City of Lake View were 2,508 in favor; 1,999 against. The number of voters may seem low considering the population was only 52,000 due to two things: women did not yet have suffrage & the rules for the foreign-born to become citizens were strict. 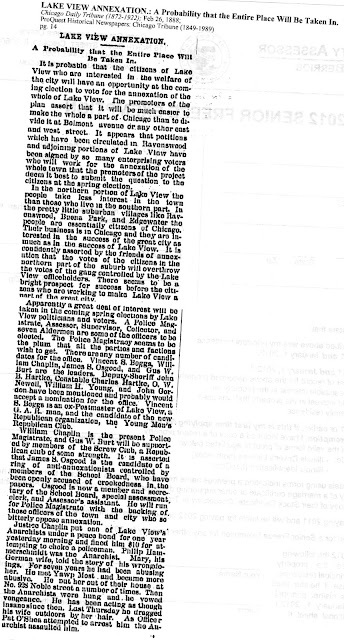 A number of residents were foreign-born immigrants hence not citizens of the United States'. Former Lake View City Treasurer says NO! 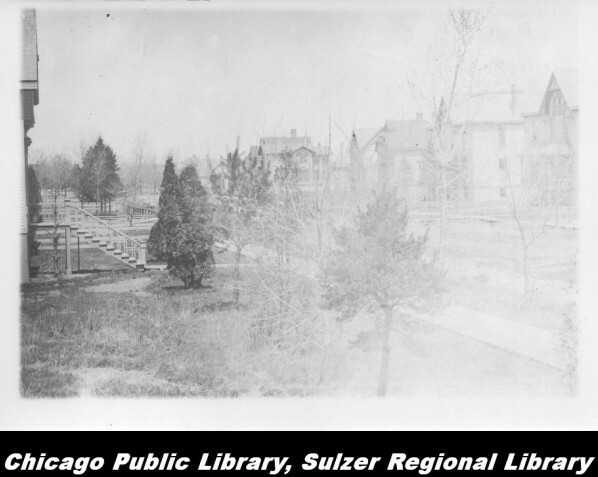 In 1853, at age 24, DeWitt Clinton Cregier was already recognized for his expertise and recruited from New York to design the water‐pumping system for the fast‐growing city of Chicago. After manning the pumps throughout the night during the Great Fire of 1871, he was called a hero, went on to serve as city engineer, then commissioner of Public Works, and was elected mayor in 1889. As mayor, he won the 1893 Columbian Exposition for Chicago, in competition with other cities, and annexed more land than any other mayor according to a book called 'The New York Orphan Who Built Chicago; The Story of DeWitt Clinton Cregier, a 19th Century American Engineering Genius'. One of his major tasks was to start integrating into the city such annexed suburbs as Lake View, Hyde Park, Lake, Jefferson and part of Cicero, which added 128.24 square miles to the city's 44 sq. miles. His Grandfather (x 4) saw similar public service in 1653 as burgomaster of the newly chartered city of New Amsterdam, now New York City. 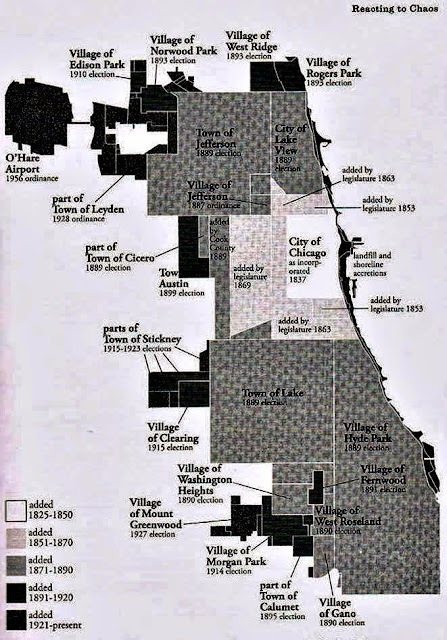 The commanding influence of the officials of the city and former township would last for decades due to the fact that the integration of all the townships that the City of Chicago acquired in 1889 would take time. 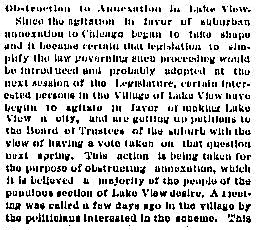 Old habits die hard and the newly formed District of Lake View did not give up power and influence easily. I would say governmental integration took at least a decade.